What is there to say about GoDaddy and its over-the-top commercials that are famous throughout the world? Well, for a start, they’ve been a player since they were founded in 1997 and they’re no strangers to controversy. However, it seems they’ve eased back on their advertising debauchery and they are one of the biggest industry contenders when it comes to anything Internet related. 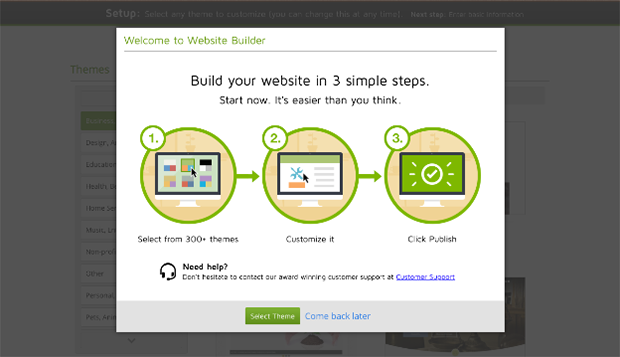 So is it surprising to find a website builder in their product lineup? No, not at all. But let’s see if they are really good, or just relying on name recognition. If you want to buy only the website builder from GoDaddy, you will first have to register your general account. After that, you will be able to purchase any of their products, including the website builder. After selecting your website builder, you will be eligible to get Office 365 Starter Email and hosting for one domain, free, for one year. There are multiple options for payment methods; we really like the availability of PayPal. After you wade through the whole legal rigamarole, you will receive several emails about your purchase and/or your login details. For some things you will get a randomly generated password that you can change later. When you log in to your website builder account, you will be asked to choose what domain you want to connect with the website. It can either be the one you purchased with GoDaddy or an external account. Next, you can select one of the design templates, which are separated by categories like Design, Art, Portfolio, Education, Health and Beauty. 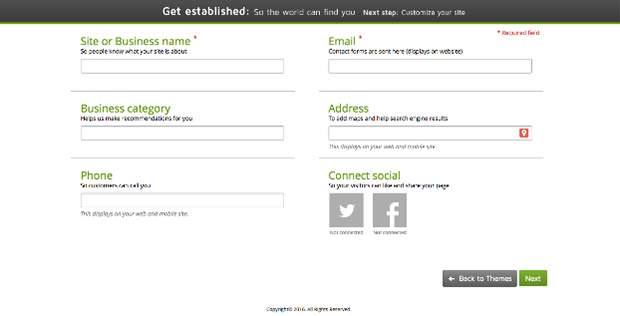 After all that information input and selecting the right names and templates, you will be taken to the website builder. It looks attractive, minimalistic and you immediately see all of your changes because it’s drag and drop. Before you dive into exploring all of the options, you will be welcomed with a short introductory video, which is quite helpful. The editor itself is intuitive and one of the least cluttered editors currently available. Everything you need will be either on the top bar or on the toolbar on your left. Even with the Personal plan, all the bases will be covered. Business plans, of course, offer more for more money, but the biggest difference is the number of templates and mobile sites. The Personal plan has only 50 design templates, while Business plans offer 300. Mobile optimization is only available with Business plans. This can leave a sour taste in one’s mouth because so many other website builders include SEO in all plans—even inexpensive and free plans. However, having said that, one of the best things about starting with a paid plan is that a domain name is included. There is no hassle with domain extensions like .godaddy.com or upgrading to connect your own domain. The drag-and-drop editor is really that and you can adjust all of the elements. You can even add custom HTML code, which is a neat feature. Also, there is an option to create backup versions of your website, which you can restore at any point. There is no native advertising, but the app store is a bit…lacking. Email marketing, menus and price lists, a PayPal button, and Yelp ratings and reviews are the only options. Adding third-party apps? That option seems to be missing. The website editor is easily manageable. The website/page you’re working on fills most of your monitor. On top of the screen, you’ll see three buttons: Save, Undo and Redo. Having Undo and Redo is a great option that’s often not included in website builders. You will also see a drop-down menu for pages. This is where you can add news or edit the existing copy. You’ll find that switching from one page to another is effortless. Next to the drop-down menu are Preview and Publish buttons. On the far right side, you’ll see a button with three dashes. It’s simply a menu where you can tweak a number of page and website settings, search for help, fiddle with the background or simply exit the builder. On the left, there’s a toolbar that’s pretty self-explanatory. If you want, you can easily hide it while rearranging elements on your page. From here, you can drag and drop items such as new pages, images, galleries, social network widgets, forms,YouTube videos and buttons. If you want to adjust an element, you can resize it by dragging or click on it and adjust its contents and settings. We really like GoDaddy’s gallery and photo options. Replacing images is a piece of cake and there are some photo editing options, but they will cost extra. The only serious drawback is that each element is edited individually, so there’s no single place to change the style for all of them. For example, if you want to change the font for all elements, you will have to do it individually for each and every one of them. Several features are available only in Business plans. You can see them even if you have a Personal plan, but when you try to use them, you will hit an upselling wall. We found this annoying. However, when you purchase a website builder, you get free email, a free domain and free hosting, which is pretty solid offer, especially considering that some website builders don’t have email as an option in any of their plans. The design themes are pretty decent. Some might need a bit of sprucing up by today’s standards, but nothing is terribly unpleasant aesthetically. Even if it’s not quite what you want, their customization enables you to tweak the design. There are 300 themes with the Business plan. Even though you only get 50 with a Personal plan, that’s still a solid number. However, if you want to switch them, you will lose your content and be forced to upload it again. Annoying and quite easily avoidable. Unfortunately, themes are not mobile responsive with the Personal plan, but that option is included in Business plans. 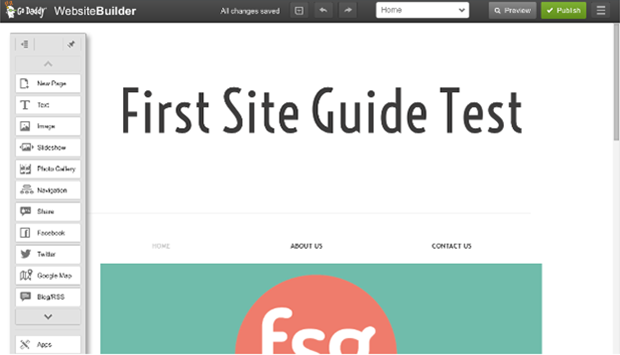 Even then, you will get one-mobile-design-fits-all theme where you can choose what is seen and what is not. We find this limitation, combined with the fact that mobile-responsive themes aren’t included it in all plans, as a major drawback. When it comes to your online store, things get tricky. By purchasing the website builder, you won’t get an online store; you’ll have to get it separately. There is a free trial, but the downside is that Stripe, which is included with their online store, does not support all countries. It’s available only in Australia, Canada, Denmark, Finland, Ireland, Norway, Sweden, United Kingdom and the United States. There’s also an option to use their Web Store Design service. With this service, you’ll be able to tell their designers what sort of store you want. The entire store will be designed in two weeks, after they verify receipt of all your content and requested files. However, you’ll have to pay a one-time build fee of $1,499.99, plus a monthly hosting fee of $29.99. This is, coincidentally, the same monthly price for their online store if you live in one of the countries where it’s offered. 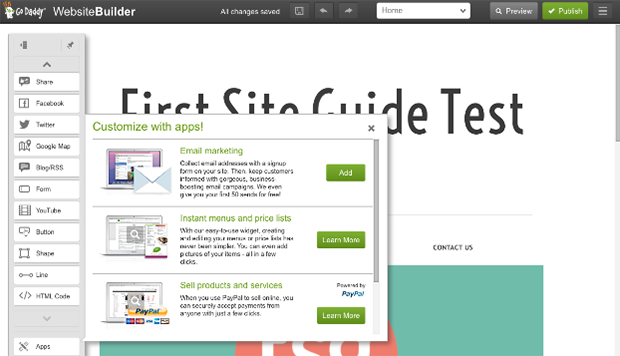 You can install a PayPal button, but when it comes to e-commerce solutions, it’s literally a whole new GoDaddy product. SEO is essential these days if you want your website to be searchable. However, GoDaddy only offers SEO with the most expensive plan, which is a real drawback. Even then, you’ll only be able only to adjust keywords, headlines and body text. This capability is usually free with other website builders. As for statistics, you might see some rudimentary information in your profile, but for in-depth stats, you’ll have to use third-party analytics. GoDaddy will provide you with hosting when you purchase any of its plans. The amount of bandwidth available to your website, however, varies per plan. If you want to export your site, you’re out of luck with GoDaddy—and most of its competitors. The company maintains that their websites won’t function properly outside their own infrastructure. Nothing we haven’t heard before, but it would be nice to have one of the biggest names in the industry take the leap and, perhaps, establish a new standard. We can only hope. GoDaddy is a bit unusual when it comes to support. They have telephone support in many countries of the world. They also have chat support that’s conveniently placed in your website editor and easily accessible. But they do not have email support. Not that we mind, because email can often be the slowest way to get support, but it’s the most common method. Other website builders usually have email support plus an additional option or two. 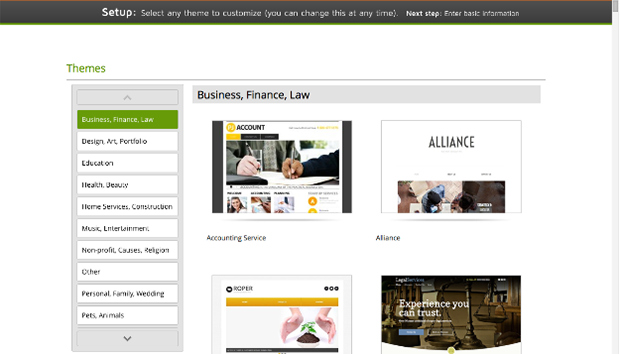 Although there is community support, it is a mashup for all GoDaddy products. Even without email support or specialized community support, all of our problems were easily and quickly solved. 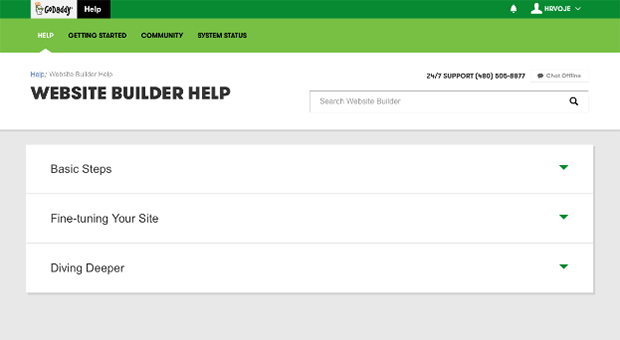 When it comes to help, there is a general GoDaddy help page, but there’s also a help page just for the website builder, which has a decent amount of information. GoDaddy offers three plans, none of which are free or available for free trial. However, they seem to be constantly on sale. They all come with a free domain in the annual plan and unlimited pages. GoDaddy is a big name for a reason. Unfortunately, that reason is not their website builder. Don’t get us wrong, it’s beginner friendly and simple to use. All elements are quite a customizable and there are a lot of templates to choose from. Additionally, you can create a backup of your website and restore it at any time point. This, however, is where the advantages stop. There is no free version or even a free trial. But when you pay, you get domain, email and free hosting, which is more than neat. It seems like their plans are constantly on sale, but constant upselling can be upsetting to people who paid full price. Having the online store as a separate product was one of the greatest disappointments, not to mention that it is not available worldwide. Additionally, some features that are limited by plan or missing altogether, such as SEO, blogging tools and mobile-responsive design themes, are included in a number of free website builders. 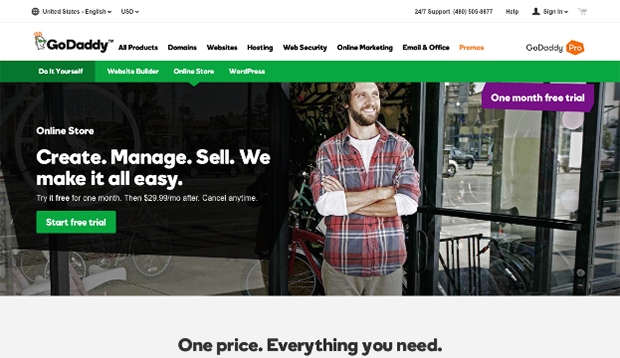 All in all, GoDaddy’s website builder is great for beginners who have small businesses and aren’t necessarily looking for an online store. GoDaddy will be not enough for people with greater needs.